Updated CV and all Educational Certificate copies with Recent Passport size Photograph and send it to the Postal address of DRBCCC Hindu College are mentioned below. Refer the official website for more Details http://www.drbccchinducollege.ac.in. 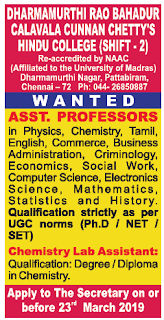 Available teaching and non teaching vacancies, Salary, Application Procedure, Qualification details are given below. 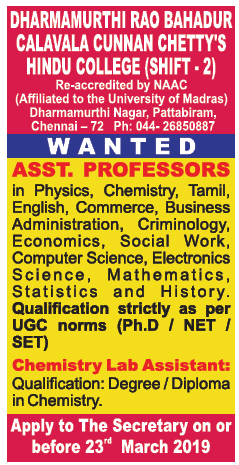 Starting Date to apply: 17-03-2019. Ending Date to apply: 23-03-2019. Interested candidates are send the Updated CV with copies of Educational certificates and recent Passport Size photograph to the postal address mentioned below.